Look no further for biblical wisdom in your times of need. This pocket-sized DayBreak Promises from Proverbs book contains topically arranged Scripture verses from the clear, accessible New International Version (NIV) Bible to help you when you most need it. 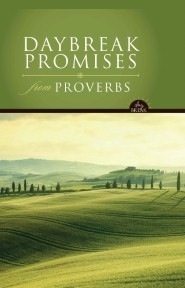 Full of rich wisdom straight from the pages of Proverbs, this collection of Bible verses is great to use every time you feel the need for the Bible’s wisdom and guidance regarding a particular circumstance in your life. For every season of life, God has promises that offer direction, peace, wisdom, and perspective.